Regiment (Territorials ) in the 1930`s. August 1931 my mother and I stood with hundreds of others lining the streets to the entrance of Witton barracks. Amongst all the surrounding conversations there was the slight sound of a military band. 'They`re coming' was the repetitive words from the crowded pavements and then the marching music became louder and louder as the regiment marching from Snow Hill Station reached close to the barracks entrance. In front was a soldier escorting the goat wearing the regimental coat, followed by the band and the battalion marching to attention with arms sloped. A right wheel and into the barracks, gates closed, inside the music ceases. Every year the same scene was repeated. The two weeks camp took place every August at different locations, Salisbury Plain, Arundel and Corfe Castle amongst others. Bell tents for kits and sleeping, marquees for meals and long ditches dug with long poles supported above the ground level and surrounded by a hessian wall to allow several men to have bowel movements at the same time. The middle sunday of the camp was given over to visiting wives and children, a meal and drinks were put on for them which was served by their husbands. My father served in World War 1 and signed on for a further four years. On discharge he joined the jobless thousands of others; in his case he was set to work breaking stone, at Aston Reservoir, in return for a meal ticket. Two years later, 1924 the year of the Unemployment Act and pay, he obtained a low paid job as a clerk. To supplement his income, as dozens of others, he signed on to become a territorial with 8th Battalion. So started on a new road with a wife and child. Christmas came and the men put on a christmas party for their offsprings in the drill hall. The children sat at mess tables and were given a party hat, cake and a drink., whilst on the mezzanine the band played christmas music-it was wonderful. This was repeated every year. Every month the soldiers paraded on sundays for church parade or the rifle range at Kingsbury. Saturday nights my father polished his boots, buttons and blancoed his webbing ready for the next morning, which started another ritual, trousers with creases sharp as a knife, boots on and drawing up the trouser bottoms to a measured height before the winding on of the puttees, folding down the trouser calves to a set height and two stamps of the feet to make every thing in place. Buttoning up the tunic and ensuring his hat was correctly fitted, a kiss for my mother and me and the front door closed. Thanks to father`s influence, I accompanied the soldiers to Kingsbury rifle range where my father who specialised in the water cooled Vickers machine gun won the silver medal every year. Each time he used the gun I was allowed to sit at the side and watch. It was a precise disciplined exercise repeated time and time again. Check gun, etc- load- fire- gun jammed, with movements fast the parts were stripped and reassembled. After the target practice with the Vickers I would be escorted down to the butts where standing to one side I`d watch the targets being raised, ripped with bullets and then lowered. Before the advent of field telephones the scores would be indicated by waving flags or a large disc moved across the target in certain directions. Later, during war service, the steady 460 rounds per minute would become a comforting sound at night. On occasions my father, in his regimental dress uniform and accompanied by his wife, attended the regimental dances which were a get together of friends and wives. It was a closely knit group that supported each other in times of strife or trouble; typically when I had problem with a gum and tooth father took me to a dentist, another territorial, who gave his time free of charge. Another instance comes to mind that when one of the soldiers hit really hard times he was helped out by money collected from his comrades. The barracks was often visited by regular army groups, the Coldstream Guards band played at a local cinema for territorial's, tanks and their crews stayed at the barracks and I with others were taken inside the vehicles, where we learned what the crews did. August 1939 my mother greeted me at the door on return from work ' Your father received a telegram to report immediately to the barracks and he has gone'. It was not unexpected in our household for we felt that war was inevitable. Father had a short leave from France in November and he gave his summation: 'that the general opinion that the war would be finished by Christmas was rubbish and that the enemy would swoop down through Belgium as in the previous war'. The 8th battalion fought in the rearguard action to Dunkirk in May 1940, my father survived but of his two close friends, one was killed and the other taken prisoner. The situation was chaotic, the three hundred and thirty eight thousand survivors had been rescued by dozens of small and large boats across the English Channel. Men had lost all their equipment and arms, as they landed they were given food and drink by volunteers before making their way to their homes. Father was told to report to the barracks and it was there he with others including military police visited homes to find men. 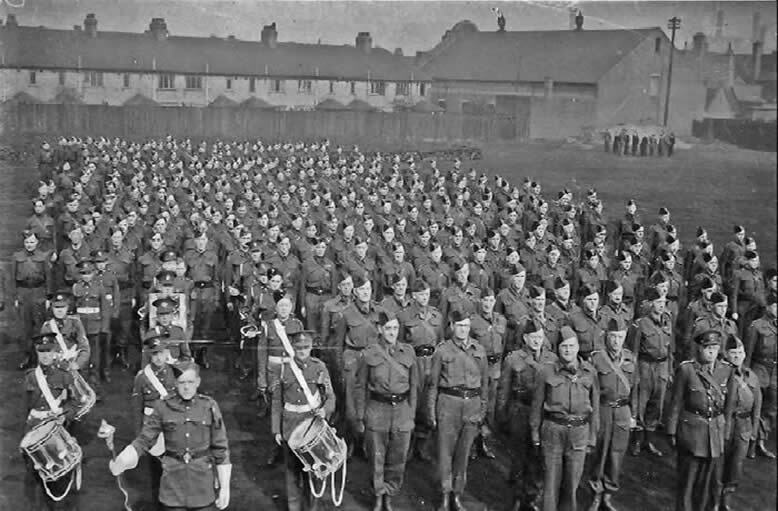 Typically of the time the battalion was reformed and military training began; my fathers voice could be heard in Victoria Road as his Company was being drilled around Aston Park. 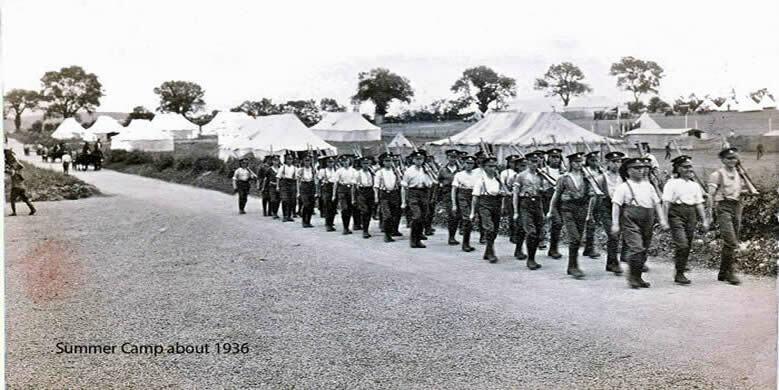 I`m not sure whether it was the battalion or just a company but he took them on a 110 mile route march as part of the retraining. The families of old comrades were not forgotten and I knew of one poor local family whose husband and father was a prisoner of war, which was given money by my mother, on behalf of his comrades. One of many unrecorded acts of compassion. Father was seconded to another regiment in West Africa and returned home in late 1944. It would be another few years before being on parade again with friends old and new in the Regimental Association. The gates of the barracks would have long closed and the drill hall deathly quiet but full of memories. contains a photograph taken of the homeguard on parade at Witton barracks. The entrance from the street was to the left rear. In the early days some of the ground was covered with black cinders, waste product from the gasworks, children were warned not to play there. My wife and I so very often talk about our early childhood: I regurgitate the memories of my grandmother taking me into the yard to watch airships R110 and R 112 float gently above and of her walking me reguarly to Aston Hall to learn its history from the guides, dressed in dark clothes with the coats with brass buttons. My grandparents lived in an HP house next to the sauce factory. I`d better stop roaming on.